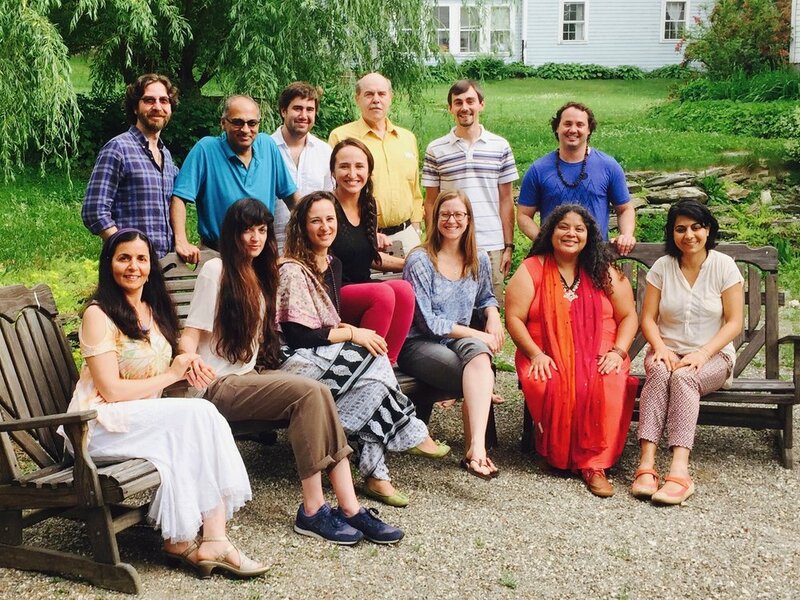 FRIS-2 (2017) "The Future of Religion & InterSpirituality"
L to R: Sousan Abadian, Netanel Miles-Yépez, Juliet Rabia Gentile, John Thatamanil, Vera de Chalambert, Thomas Millary, Chris Jalila Maddox, Peter Schein, Becky McDaniel, Matthew Wright, Brenda Salgado, Rory McEntee, Saiqa Latif. Photo by Victoria Lehtonen, 2017. 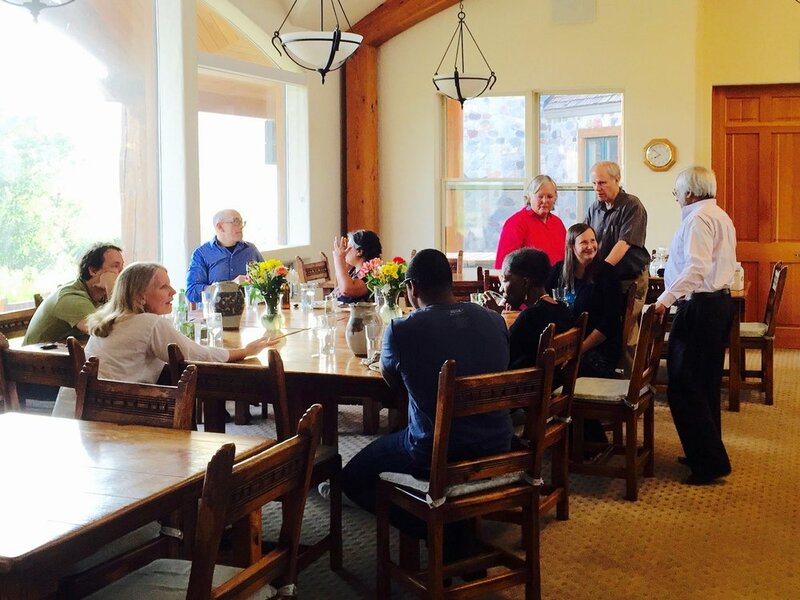 The second FRIS dialogue-retreat on "The Future of Religion & InterSpirituality" was held June 15-20, 2017 at The Abode of the Message, an Eco-Sufi retreat center and village in New Lebanon, New York. The Abode is an historical landmark, being on the site of one of the earliest Shaker villages in the United States—Mount Lebanon Shaker Village, established in 1787—using the original Shaker buildings. In 1975, after the once thriving Shaker community had dwindled and moved on, the property was taken over by Sufis of the universalist Inayati lineage of Sufism, then under the leadership of Pir Vilayat Inayat Khan, who created a new spiritual community there, reviving the “Hands to work, hearts to God” philosophy of their Shaker predecessors, whose surviving members visited the new community and gave them their blessing. Quddus Meditation Hall of the Abode of the Message. Photo by Netanel Miles-Yépez, 2015. 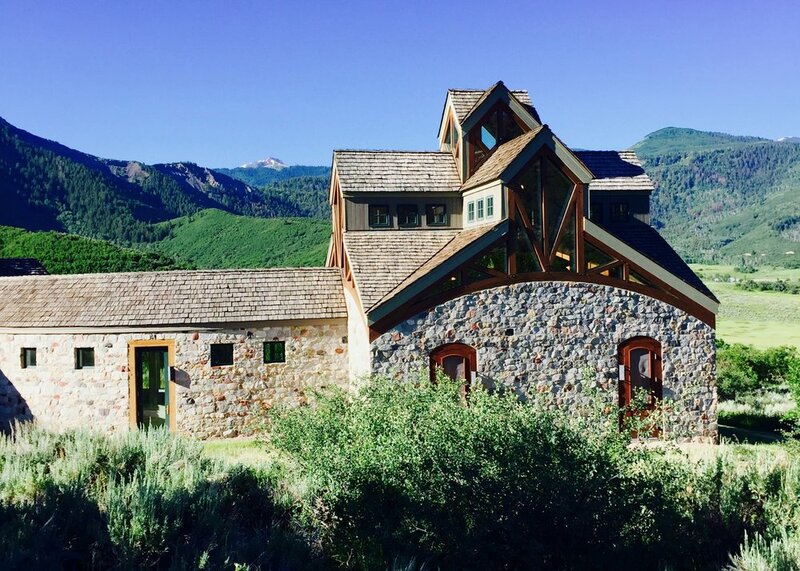 A continuation of our 2016 retreat at St. Benedict’s Monastery in Snowmass, Colorado, this dialogue-retreat explored new aspects of “The Future of Religion and InterSpirituality,” going deeper into the foundations and issues of “universalism,” “interspirituality,” “spiritual but not religious,” and “multiple-religious belonging,” in particular looking at their theological underpinnings and their basis in personal experiences. Going around the circle from L to R: Becky McDaniel, Chris Jalila Maddox, Sousan Abadian, Brenda Salgado, Peter Schein, Thomas Millary, Vera de Chalambert, Juliet Rabia Gentile, Saiqa Latif, Matthew Wright, John Thatamanil, Netanel Miles-Yépez. Photo by Rory McEntee, 2017. Sousan Abadian, Zoroastrian, specialist in healing collective trauma, and religious specialist in the Office of International Religious Freedom at the U.S. Department of State. Vera de Chalambert, scholar of comparative religion, healer, spiritual storyteller, and devotee of the Great Mother. Author of "Kali Takes America: I'm with Her." Juliet Rabia Gentile, historian of women’s history, a spiritual representative of the Nur-Ashki Jerrahi Sufi community, vocalist and percussionist. Chris Jalila Maddox, universalist Sufi, founder and director of the the Wild Woman Project and the Wild Woman Fest. Becky McDaniel, Christian Episcopal priest, chaplain, yoga teacher, and former Yoga studio owner. Brenda Salgado, traditional healer, and founder of Nepantla Center for Healing and Renewal. She is author of Real World Mindfulness for Beginners: Navigate Daily Life One Practice at a Time. Peter Schein, itinerant teacher, scientist, philosopher, interspiritual practioner and guide, and tai chi instructor. John J. Thatamanil, Associate Professor of Theology & World Religions at Union Theological Seminary. Author of The Immanent Divine: God, Creation, and the Human Predicament. An East-West Conversation. Matthew Wright, Christian Episcopal priest, Mevlevi Sufi, and retreat leader seeking the renewal of the Christian Wisdom tradition within a wider inter-spiritual framework. Observer participants included: Saiqa Latif and Thomas Millary. L to R: Vera de Chalambert, Netanel Miles-Yépez, John Thatamanil, Becky McDaniel, Peter Schein. Photo by Rory McEntee, 2017. 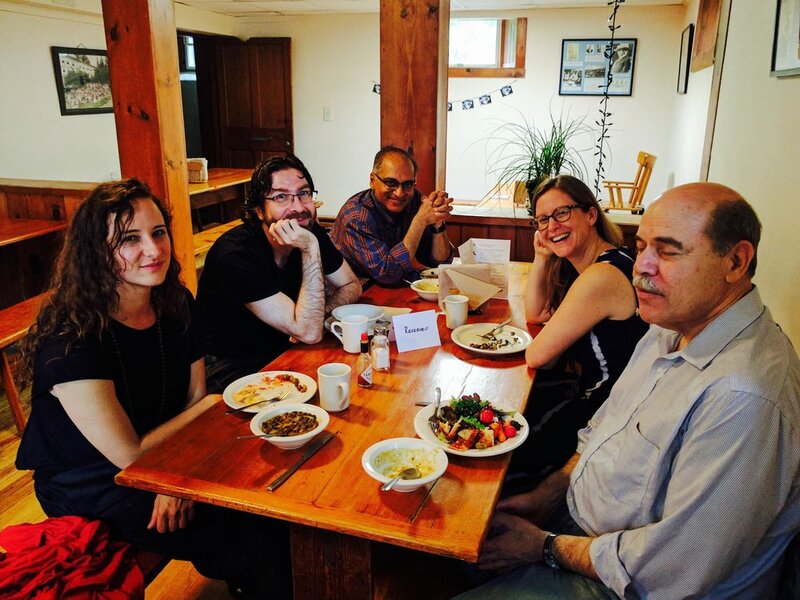 See the Facebook group, "Future of Religion & InterSpirituality," for updates on and the continued dialogue of the FRIS-2 alumni. 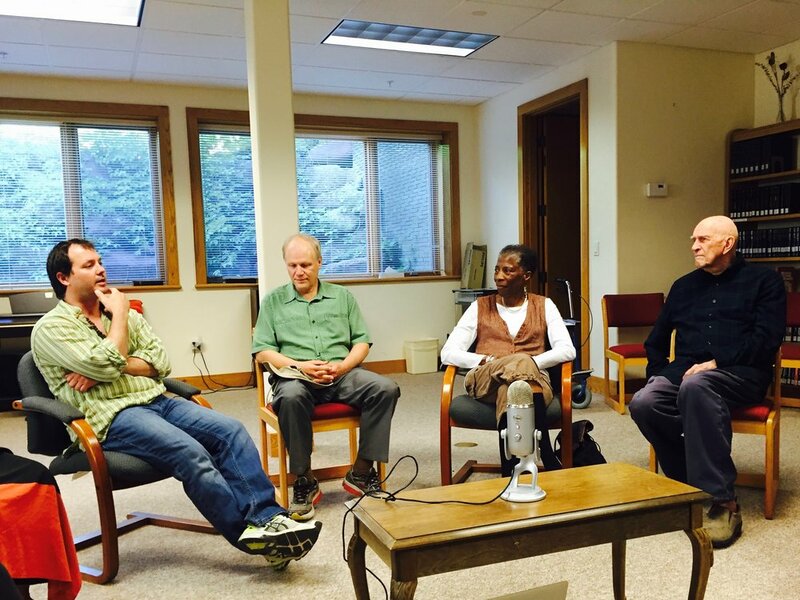 Diane Berke interviewing Rory McEntee and Adam Bucko at the Dawn of InterSpirituality International Conference, September 29 - October 4, 2013, at the Cascadian Center, Mt. Vernon, WA.